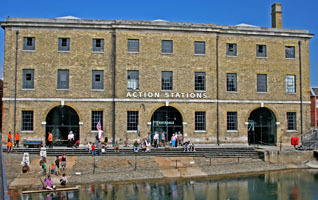 Housed in the historic Boathouse No 6, at Portsmouth Dockyard is Action Stations, a hands on interactive Royal Navy experience. Kids of all ages will enjoy Action Stations which has a great range of interactive simulators depicting all aspects of naval warfare and technology. The simulators on the ground floor of Action Stations let you enjoy and experience different areas of naval technology ranging from the Ops Room, Weapons and a Royal Navy warship bridge simulator, where you control the action. The ground floor is also where you will find 2 different climbing activities, simulating training as a Royal Marine. Close to the main entrance is a tall static climbing wall and in the south west corner you will find the smaller but equally challenging dynamic climbing wall which can be adjusted, by the operator, whilst you are climbing to increase the speed, angle and difficulty of your climb. Action Stations has a 275 seater cinema where exciting action packed Royal Navy related films are shown, lots of loud explosions and gunfire. The cinema at Actions Stations is regularly used to show current cinema releases. The programme can be viewed by visiting the No6 Cinema website. The upper floor at Action Stations is home to even more interactive hands on displays. These are more technological, thought provoking, educational in theme and covers a vast range of different Royal Naval topics such as engines, electronics, navigation and much more. 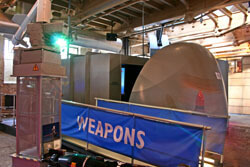 Action Stations can also be hired for conferences, product launches, team building events and childrens parties. 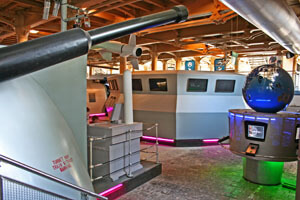 It is also home to a multi level Laser Quest adventure based around a hi-jacked container ship and inspired by the film "Command Approved" - Laser Quest must be pre booked.